Zine Machines Series 2 might just be a cover story all on it's own! Indianapolis, IN (March 2012) Just because the magazine was issued in 21st century doesn't mean that the featured cover car wasn't a historic, octane legend from years past. 'Zine Machines Series 2 features a plethora of cars from the '60s and '70s thatyour dad and his pals drooled over. But don't worry, because 'Zine Machines also the newer muscle cars roaming the streets these days. In series 2, the 2010 Shelby GT500 featured on the cover of Motor Trend (March 2009) makes an appearance in a blaze of Grabber Blue with Torch Red racing stripes. 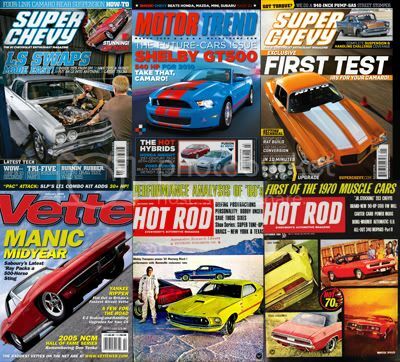 'Zine Machines Series 2 features magazines from Super Chevy, Motor Trend, Hot Rod and Vette from 1968 to 2011 and brings their cover cars to life. Check out below to see which magazines made the cut!